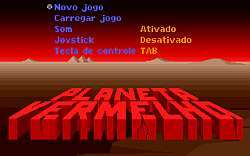 This rare game was developed entirely in Portuguese in Brazil for which only 3000 copies were produced and distribution was made on newsstands in the city of Goiânia (GO). Red Planet has two astronauts sent to Mars in a powerful spaceship and on route they surpass the speed of light, and due to that they go back 65 million years in time and reach the planet Mars only to be captured by an alien spaceship. One of the astronauts is trapped inside a mountain and must get out to look for his friend and his spaceship, and on his path he will be faced with different obstacles and puzzles, such as a giant reptile, leaping chasms on the mountain, destroy alien spaceships with your laser gun, etc. At the halfway point he finds an alien spacecraft and uses it to fight other ships at a stage where it will take 1000 points to destroy the mothership. After this stage you enter a sphinx with several levels in the style of Prince of Persia game, where you must uncover several puzzles to find your spaceship and return to Earth. At the end of the game, the astronauts discover the cause of the extinction of the dinosaurs on Earth! The author later made the game available for free.